This is an all-WELDENZ bridge. WELDENZ white resin is used for artificial teeth and retainers (clasps). WELDENZ white resin is used for the retainers (clasps) on both ends and WELDENZ pink resin is used for the denture base. This combination, with resin denture teeth makes it more durable and highly aesthetic. No metal is used; highly aesthetic. Combined with the artificial teeth for durability and aesthetic purpose. Most popular use of WELDENZ in the market. Can also be made into separate bridges for each side of the jaw. WELDENZ white resin is used for the artificial teeth and the clasps on the end. WELDENZ pink resin is used for the denture base. This is effective when there is enough undercut in the abutment teeth; a groove (at least 1.0-1.5mm depth) is required between abutment teeth and adjacent teeth. WELDENZ white resin is used for the artificial teeth. This will fit the patient’s mouth better. WELDENZ white resin is used for the abutment teeth, while the pontics are denture resin teeth. This entire bridge can be made with the WELDENZ white resin. No metal is used; aesthetically more appealing than conventional methods. 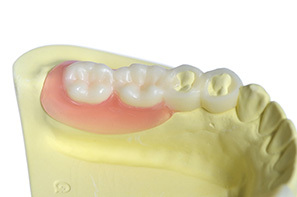 The flexible nature of WELDENZ makes this bridge removable. Being removable means patients’ oral hygiene is improved. The thin material allows flexibility in constructing bridges that require little or no preparation (milling) of the natural teeth. The healthy natural teeth are preserved. Crowns with retainers (clasps) are popular for this reason. A regular visit to the dental clinic for cleaning and polishing is recommended.